Tank Abbott made the jump from Ultimate Fighting to the world of Professional Wrestling when he signed with WCW..
December 13, 1999 – Nitro: Tank Abbott vs. Meng ended in a double count-out. December 20, 1999 – Nitro: Tank Abbott vs. Jerry Flynn ended in a no contest. December 23, 1999 – Thunder: Tank Abbott vs. La Parka ended in a no contest. December 27, 1999 – Nitro: Tank Abbott defeated Shane (Virgil). January 3, 2000 – Nitro: Tank Abbott defeated Lex Luger by disqualification. January 16, 2000 – Souled Out: Tank Abbott defeated Jerry Flynn in a “Shoot” match..
January 17, 2000 – Nitro: Tank Abbott defeated The Maestro. January 24, 2000 – Nitro: Tank Abbott defeated Al Greene. February 2, 2000 – Thunder: Tank Abbott defeated Villano IV. February 7, 2000 – Nitro: Tank Abbott defeated The Barbarian. February 14, 2000 – Nitro: Tank Abbott defeated Rick Fuller. February 16, 2000 – Thunder: Tank Abbott defeated Van Hammer. February 20, 2000 – Superbrawl: Tank Abbott defeated Big Al (aka 911) in a skins match..
~~~In the feel-good moment of the year, Abbott put a knife to Al’s throat..
February 23, 2000 – Thunder: Tank Abbott defeated Mike Jones. February 26, 2000 – Saturday Night: Tank Abbott defeated Villano IV. February 28, 2000 – Nitro: WCW world champion Sid Vicious defeated Tank Abbott to retain the title. March 15, 2000 – Thunder: Tank Abbott defeated Buzzkill. March 20, 2000 – Nitro: Tank Abbott defeated The Barbarian. March 22, 2000 – Thunder: Tank Abbott vs. Fit Finlay ended in a no contest. March 25, 2000 – Saturday Night: Tank Abbott defeated Dave Burkhead. March 29, 2000 – Thunder: Tank Abbott defeated Disco Inferno. 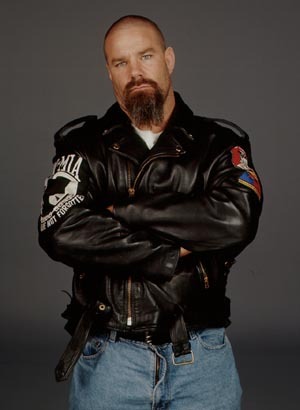 May 1, 2000 – Nitro: Tank Abbott defeated Diamond Dallas Page. WCW World champion David Arquette defeated Tank Abbott to retain the title. May 8, 2000 – Nitro: Scott Steiner defeated Tank Abbott by disqualification. May 29, 2000 – Nitro: Rick Steiner and Tank Abbott defeated Kevin Nash by disqualification in a handicap match. June 5, 2000 – Nitro: Golberg defeated Tank Abott. June 11, 2000 – Great American Bash: Scott Steiner defeated Tank Abbott in an “Asylum” match to retain the heavyweight title..
June 14, 2000 – Thunder: Mike Awesome and Kanyon vs. Rick Steiner and Tank Abbott ended in a no contest. Tank Abbott briefly teamed with the trio known as Three Count, acting as some kind of “Groupie”..
July 19, 2000 – Thunder: Tank Abbott defeated The Great Muta. August 9, 2000 – Thunder: 3-Count (Evan Karagias, Shane Helms & Shannon Moore) & Tank Abbott defeated The Misfits In Action (Corporal Cajun, General Rection, Lt. Loco and Sgt. A-WOL). August 21, 2000 – Nitro: Tank Abbott vs. Vampiro ended in a no contest. August 23, 2000 – Thunder: The Dark Carnival (Shaggy 2 Dope, The Great Muta, Vampiro and Violent J) defeated 3-Count (Evan Karagias, Shane Helms, Shannon Moore) and Tank Abbott. January 2003: Tank Abbott is scheduled to return to UFC on 2/28 in Atlantic City against Frank Mir..
May 2005: Tank Abbott weighed in at 275 pounds for his match tonight in Honolulu against Cabbage Correira..
August 15, 2008 – IGF: Josh Barnett defeated Tank Abbott.